This color teal is known to represent a calming mood, and feelings of rejuvenation and restoration. This popular combination of blue and green together, helps create a mood that’s perfect for a bedroom sanctuary. 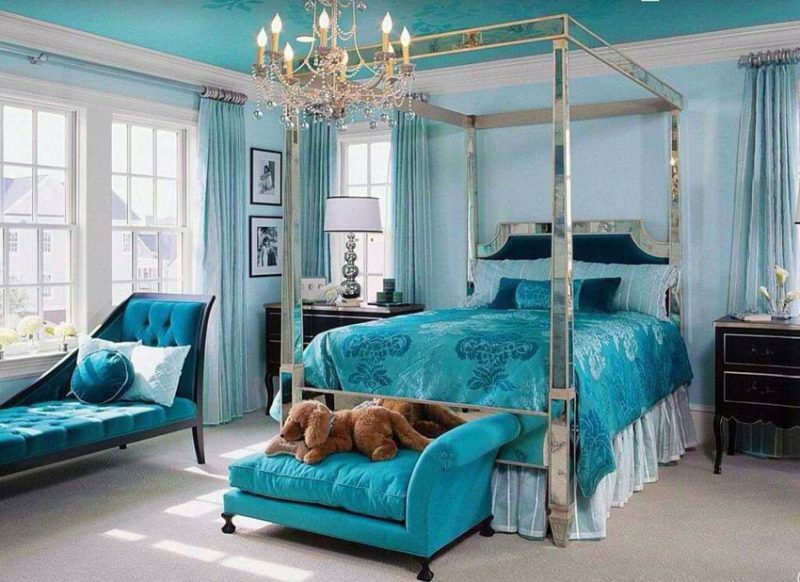 These interesting photos include furniture, decor and interior designs using different shades of the color teal. With this gallery we hope you’ll get plenty of teal bedroom ideas and inspiration for your own designs. In the pictures above a pleated white princess bed curtain hangs over a button-upholstered bedhead with matching teal bedsheets and throw pillows. The lamp chandelier hanging from the silver and teal tray ceiling gives refinement and luxury to the bedroom and watches with the old world style wooden chair and desk. Dark wood cornices and doors complement the bright colors, as does the beige stone floor tiles. 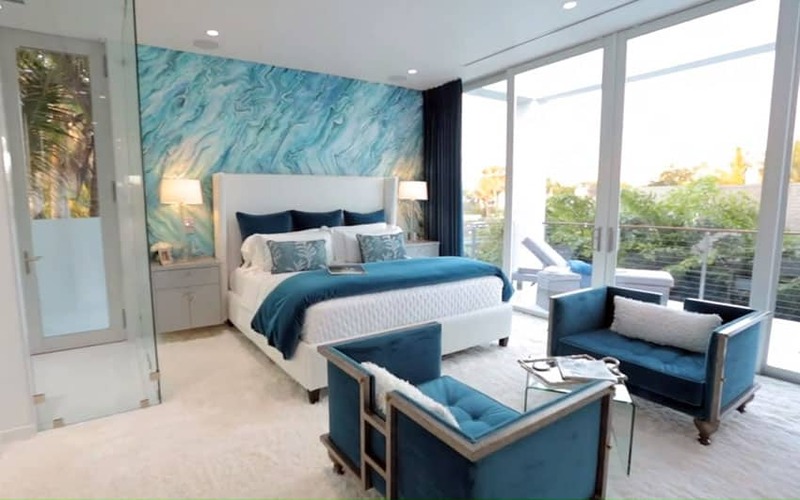 A winning color combination, silver and teal figure largely into the design of this room, with the bedframe and lamp shade base in polished silver, and teal used for all the upholstery from the head board, to the chaise lounge seat to the bedsheets. Classic dark wood elements for the side tables and chaise lounge seat frame add to the elegance of this Classic Luxe bedroom, while powder blue walls match the theme and make the strong teal colors stand out more. The candelabra hanging from the ceiling completes the whole Luxe look. 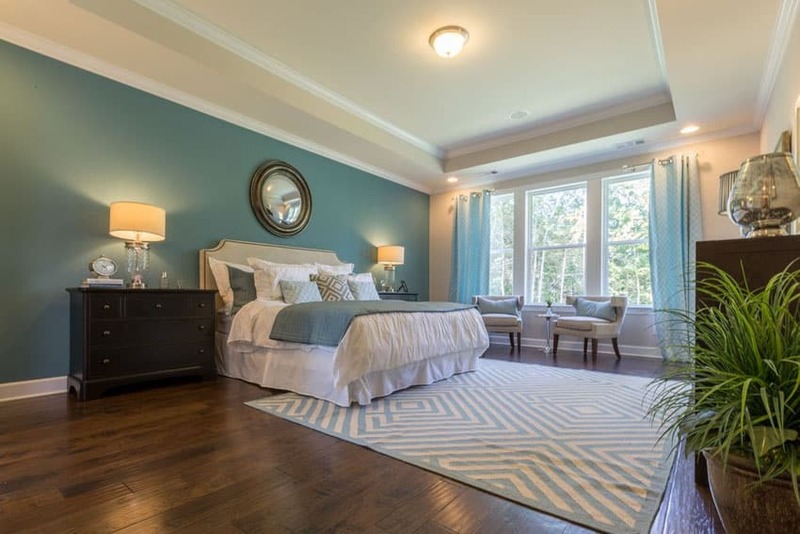 This master bedroom with teal decor and furniture pieces looks beautiful and inviting. Its large abstract accent wall with a green, blue and white color pattern makes a big impression. Take your pick and relax in one of the plush two-seater chairs, or recline in the lounge chair outside on the second story balcony. 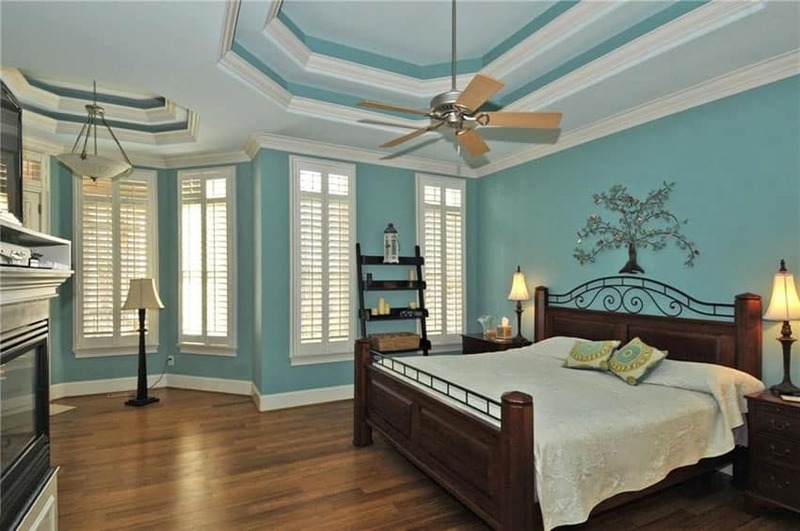 This beautiful bedroom gets its teal accents from the more muted tone used on the bedsheets and throw pillows. 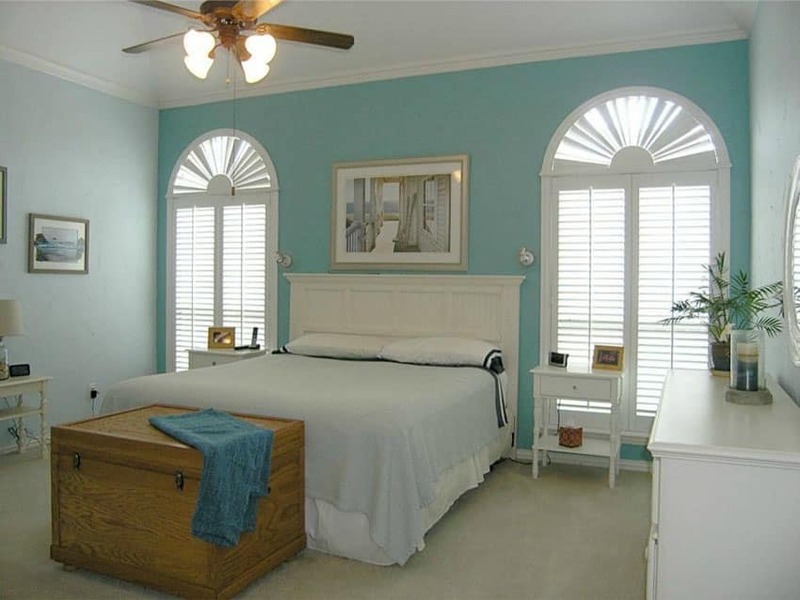 White blankets match with the white plantation shutters and bring a Beach house vibe to this bedroom. 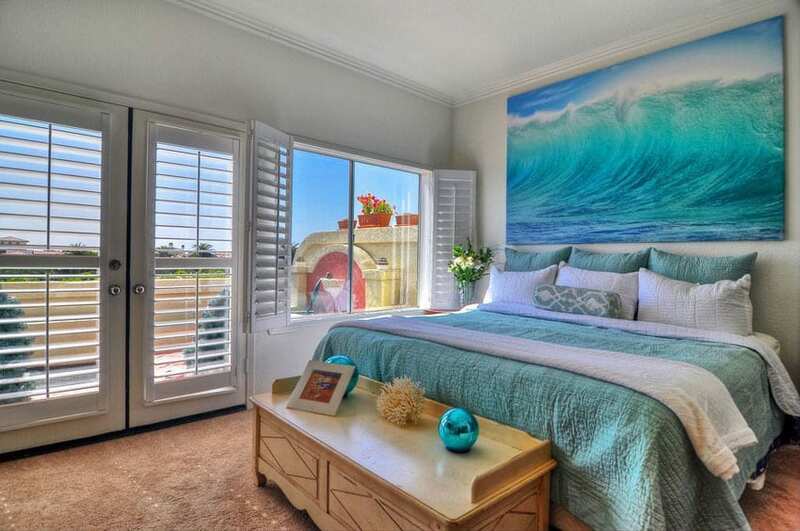 The light wooden bench at the foot of the bed matched with the burnt umber carpet further enhance the beach vibe, as does the ocean wall art right above the bed hanging on the room’s white walls. 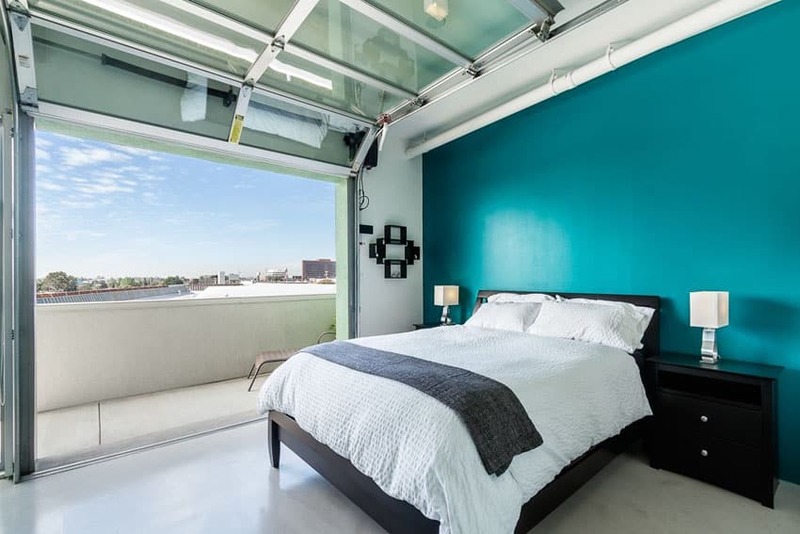 This modern city chic bedroom features a large roll up door with a view of the city. The sleek black wood used for the bedside tables and bedframe match well with the white and polished silver lampshades. The white bedsheets matched with the grey throw are chic and minimal, while the splash of teal on the whole back wall gives this city chic bedroom a sassy touch of color. The Jacquard traditional comforter set brings a touch of elegance with its embellished pillow shams, pleated flanges and decorative pillows. Coming from the Jacquard’s Romeo and Juliet Collection, each traditional comforter set comes with 1 comforter, 2 pillow shams, 2 euro shams, 1 bedskirt, 1 cushion, 1 rectangle pillow and 1 round pillow – the complete and perfect set for your old world luxe bedroom. The funky walls are decked in either polka dots and pinstripes and go with the flowery paisley design for the bed sheets, muted by tones of white and brown. Around the bedroom, white and brown tones also tone down the bright teal walls, with the brown wooden bedframe, dresser and lavatory counter, and white doors, curtains and ceiling fan. The beige carpet ties the whole look together with its muted tones. 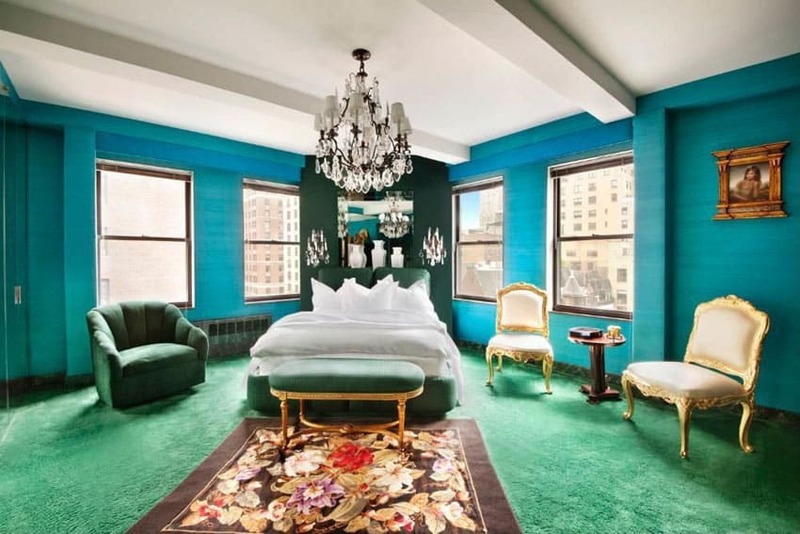 This modern Louis XV style bedroom features the color in vogue of the era, emerald and teal, as well as gold framed, white upholstered royalty chairs on one side of the room, surrounding a small wooden coffee table. Double hung windows on either side of the bed bring in a lot of natural light while the matching wall lamps and chandelier match the regal style of the room. The old French luxury style is completed with the emerald and gold bench at the foot of the bed as well as the floral rug beneath it. This Contemporary style teal bedroom features a more subdued shade, which is further subdued by the heavy grey, beige and brown accents in the room. Grey and white bedsheets on a bed with a white studded headboard are matched with a dark grey bed skirt and rustic wooden side table. The dark wood plank flooring is given color with the light grey throw rug that matches with the upholstered bench at the foot of the bed. The matching drum pendant lights bring in light to this subdued Contemporary bedroom. This Contemporary classic bedroom features shuttered windows on either side of the bed, flanked by two thin white painted bedside tables and black iron and glass wall sconces. The light wood plank flooring ties the whole bedroom together, and lets the bed with its brown, white and red bed sheets standout. The bed frame and bench at its foot is stylish and feature matching Millersburg upholstery. The upholstery gives a softer touch to this bedroom with its chic nail head trim along the bench’s backrest and base. The build of the bench is of solid wood and wood veneer and features slender tapering legs. This minimalist modern bedroom comes mostly in white and features important pops of color with a teal work chair and drapes. The padded back wall in teal also adds to the quirkiness of the room, as does the white and teal patterned carpet. White is used for the bed frame, bed sheets, walls, desk and shelves. It is also used for the functional bay window with underseat storage. The curved windows and plantation shutters on either side of the matching white paneled headboard give this bedroom a cottage style feel. The room features white bed sheets, side tables and dressers which gives it clean lines and an uncluttered look. The room is given warmth via the yellowish wood trunk at the base of the bed as well as the teal colored back wall that frames the windows very well. The subdued hues of teal in this dark wood and white bedroom give it a Contemporary chic feel. The large bed is decked in white bed sheets with subtle teal accent throw pillows. The teal back wall is a great accent to the white walls and white tray ceiling of the bedroom, as are the patterned blue curtains to the windows, and the powder blue pillows to the armchairs. Lastly, the dark wood plank floors are given lightness via the geometrical white and blue area rug by the foot of the bed. Gold and glass accents are present in the room via the lampshade, ceiling lamp and other décor. This children’s bedroom looks playful yet comfortable with its horizontal striped teal and white walls and plain white four poster bed with sheer curtains matched with the colorful pink and green bed sheets and pillows. The rest of the room is evened out with solid teal walls and a white plantation shuttered window, as well as the beige carpet. This high ceiling bedroom with glossy teal walls has a classic contemporary feel, because of its unique modern colors mixed furniture in a classic profile. The white bed frame mixed with white bed sheets and a hanging chandelier provide classic elements, while the minimalist shelves, work chair and reclaimed wood desk give a more modern vibe. The silver and teal artwork above the bed gives this bedroom an interesting focal point. This traditional style bedroom features white plantation shutter windows, a classic heavy wood and wrought iron bed frame, warm wood plank floors and pyramidal lampshades and floor lamp. The cottage-style feel is further shown with the ladder-type wooden shelf at the side of the bed as well as the fireplace at its foot with trims. Modern elements are brought in to make it a bit more contemporary via the ceiling fan and the bronze tree sculpture above the bed. 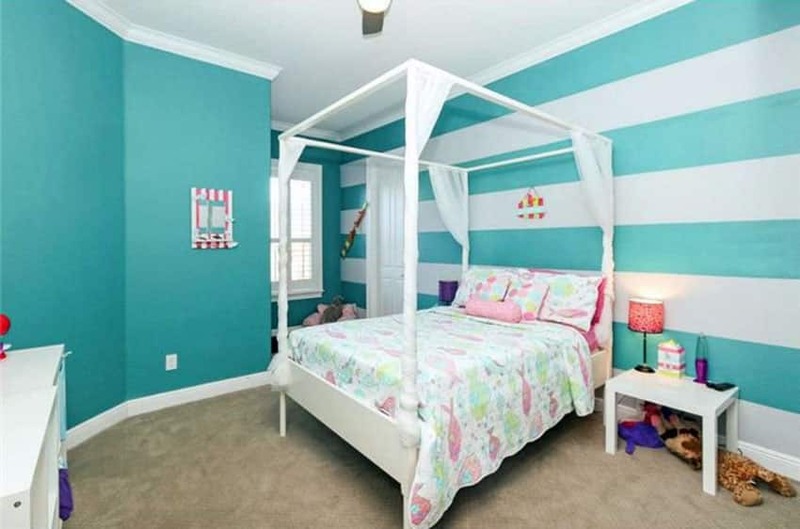 There are many different teal bedroom ideas for creating a cute space for your child. This bright colorful children’s bedroom has simple furniture with its maple wood drawers, steel framed bed, white double hung windows and off-white carpet. 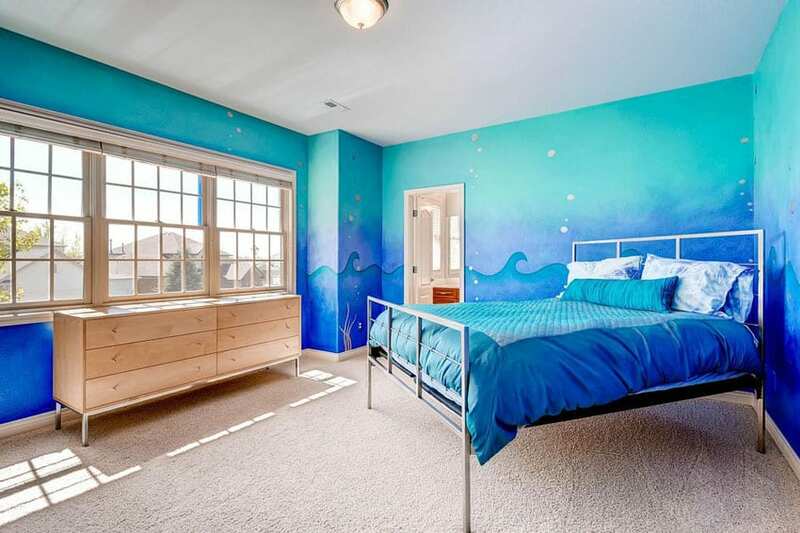 The most unique element of this bedroom is its wave art design walls in deep blues and greens, which matches with the blue-green bedsheets and pillows. Grey and white pinstriped walls match the blackframed windows and white floors. A faded Moroccan rug also adds subtle color to this Contemporary style bedroom, as do the light brow n bedsheets. The teal-colored furniture are the real center points in this bedroom, with the sleigh bed, side tables and console in the same shade. The other teal furniture include the Corbeil 6-drawer desk, which is stylish and functional, and features non-removable drawers which are dovetailed for full extension capability. The Corbeil set is available in many solid colors or wood veneers, giving it versatility. In addition, the top of the dresser can even be built to accommodate a changing table. 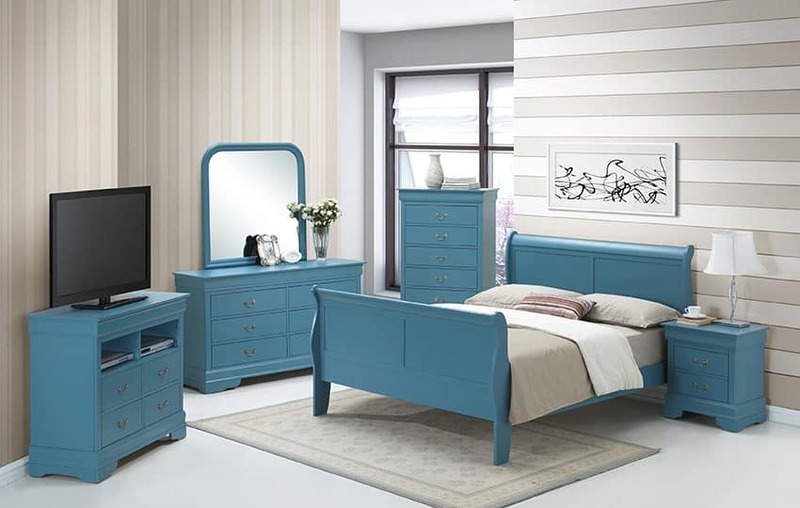 Click here to shop for teal bedroom furniture. 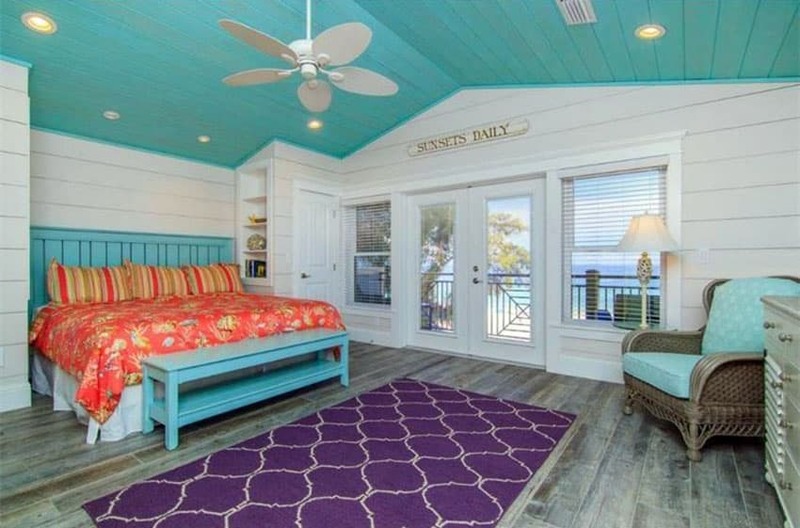 This tropical cottage bedroom features white shiplap walls and a sloping beadboard ceiling. Rustic aged wood floor planks are given color with a purple arabesque patterned throw rug at the foot of the bed. Teal accents are also present in the armchair upholstery and the bedframe and bench at its foot, and is complemented by the red-orange floral and pinstriped bedsheets. A pair of windows flanking a set of French doors opens up onto the veranda looking out into the ocean. 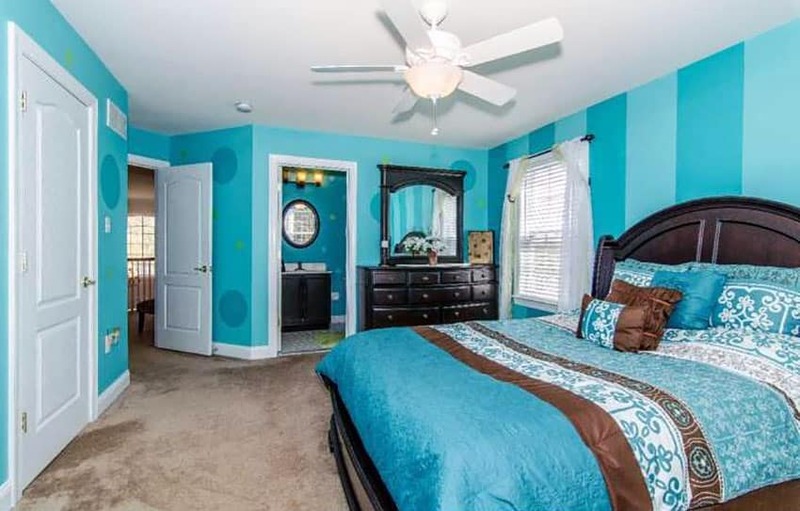 The teal bed sheets and comforter provide a pop of color to the room with its bold hues and stand-out patterns. This Germain 7-set reversible set includes 1 comforter, 2 shams, 3 decorative pillows and a bed skirt. Made of lightweight material, Germain’s bedsheet sets come in many different colors in soft tones, perfect for any bedroom style. 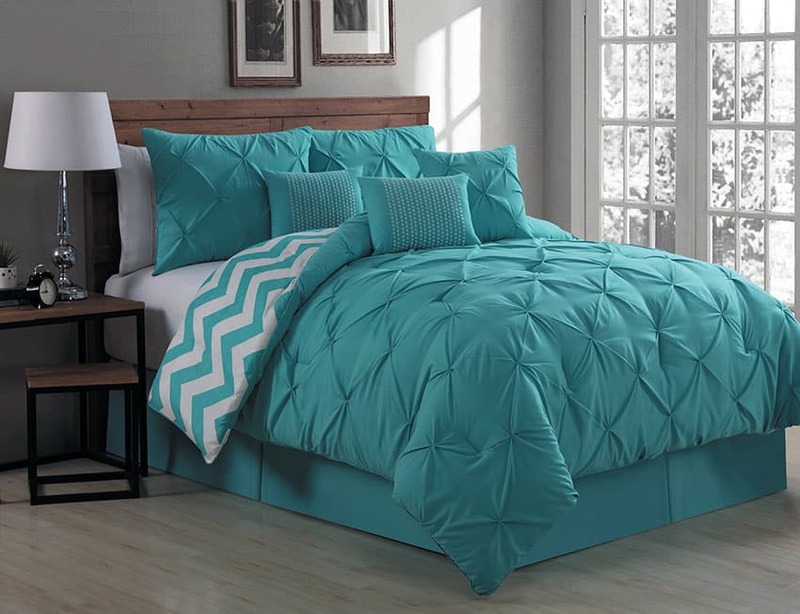 Adding colorful teal bedding can give you plenty of teal bedroom ideas to fit any style of room you desire.